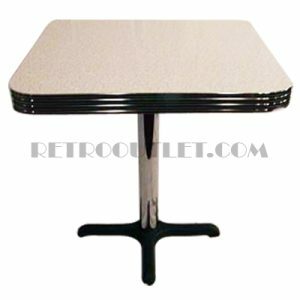 Our 36 inch Round Retro Table is shown with 2.25″ real metal banding, and a chrome column, B-Series base. This table is available in your choice of premium boomerang or cracked ice laminates, 1¼” or 2¼” Metal Banding. This is your opportunity to build your table to your specifications; see our other sizes and styles available.